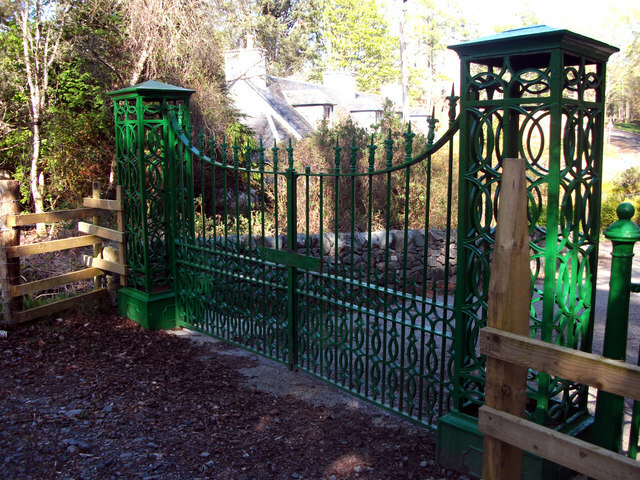 The Green Gates situated in their new location next to Quality Cottages. I got into an email discussion with donald Bain about an adjacent square (NR6885) and he told of this piece of folklore. As it will be a few years before I get back to Arisaig I repeat it here for others to use. Supposedly the owner of Arisaig House, Ashley Nicholson, was out on horseback one day,at a wee place called Drimmindarrach, and as he passed this cottage, where there lived a mother and her handicapped child, Ashley Nicholson apparently laughed and mocked the child, the mother came out and put a curse on him. We call it the Boushchach; that's it spelt phonetically. The curse went along the lines of that as a result of mocking her child, that there would never be a male heir to own Arisaig Estate.Well, as both his sons drowned at sea during the war, (their headstones are on the wall inside Arisaig Protestant Church), I guess the curse came true since it has been owned by females from then on. Firstly his daughter then her companion, a Miss Becher, until she gave it to her estate manager to avoid death duties. In the Highlands a Boustchach is taken very seriously. Arisaig House is now that it is under a syndicate ownership, maybe the Boustchach is gone.